The prelude music to the first Senate debate of the season was a Bach cantata commonly played at weddings. It was the most harmonious moment of a night where the two candidates disagreed on nearly everything save the spelling of the Alaska state bird. 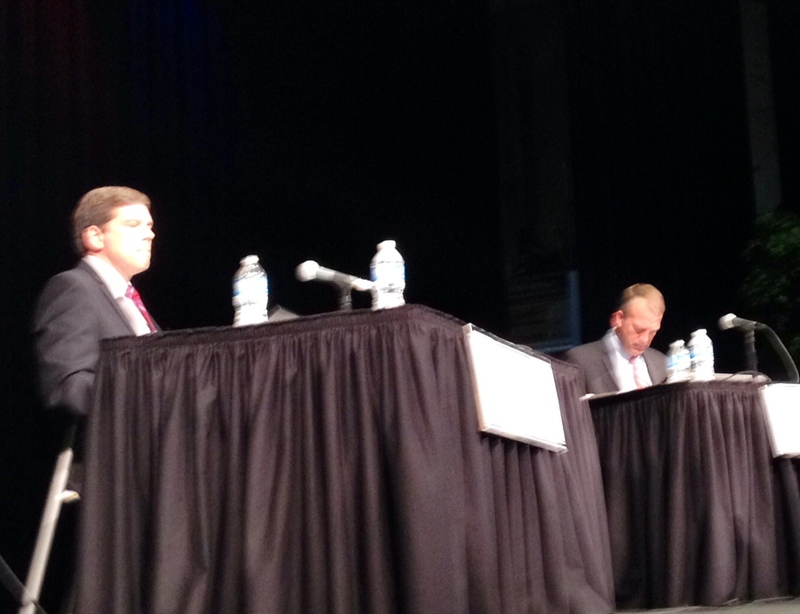 The debate was held in Anchorage on Wednesday, and it was hosted by the conservative umbrella group United for Liberty. It began conventionally enough. The candidates were asked about fisheries management, and Democratic incumbent Mark Begich used the question to cast himself as a practical lawmaker focused on Alaska-specific policies. Republican challenger and former natural resources commissioner Dan Sullivan explained he wanted more management decisions made at the state level instead of by federal regulators. Both hit on those respective messages through the night, with Begich emphasizing his experience as someone who knows how Congress operates with regard to Alaska and Sullivan presenting himself as a political outsider who wants to take Washington on. “I think immigration reform should not be comprehensive — it should be piecemeal,” Sullivan explained. And later, Sullivan said the Consumer Protection Bureau should be nullified because he believes it is unconstitutional. Sullivan, who advocated for the new capped-tax system while directing the Department of Natural Resources, wrote that he voted to keep that regime. On top of the non-answers, the lightning round resulted in some wrong ones, too. The candidates were asked a number of Alaska trivia questions, like what’s the size of the state relative to Texas. Begich couldn’t identify Lake Iliamna as the largest body of freshwater in the state, and Sullivan guessed that the Salty Dawg Saloon, a Homer landmark, was in Juneau. 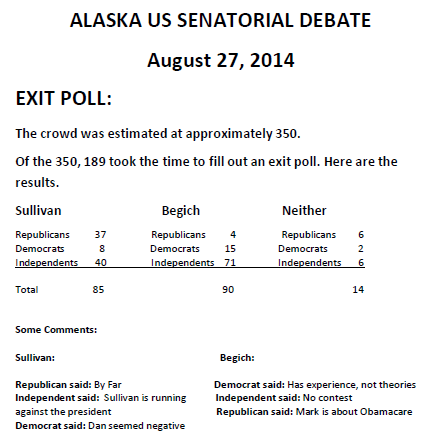 United for Liberty took a straw poll after the debate, and results show Begich narrowly edging out a win with 90 votes to Sullivan’s 85. About a dozen said there wasn’t a clear victor. But before the debate even started, it seems most of the 300-person audience had already made up their minds on who they were backing. Both candidates had healthy crowds there to support them, and they offered plenty of applause and occasional commentary. But one heckler, who came with anti-abortion protest signs, broke the decorum toward the end of the debate. When Begich gave his closing remarks and made a reference to women’s health care plans, one-time Anchorage School Board candidate Dustin Darden stood up and began shouting “What about the babies?” for one minute before debate organizers escorted him from the auditorium. Debate schedules are still being finalized, but at least a dozen more events have been proposed between now and the November 4 general election.